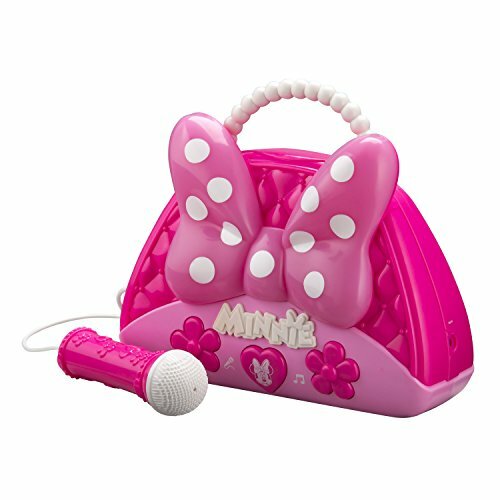 Sing along with Minnie with your very own boombox and real working microphone! Also comes with real character speech and doubles as a cute MP3 speaker! Shhhh... quiet everyone, we're about to start! Press the mic button and announce your arrival to the stage. Now, start the music and sing along just like a real performing star! Hear your voice echo across your stadium lounge as you sing your number one hit! And when you're backstage, plug in your mp3 and chill out with the speaker function. Rest up, you have another show tomorrow! Connects to mp3 device so you can sing to your own playlist or just play your music like a normal set of speakers. A fun gift for kids who love Minnie and performing! But also the perfect gift for kids who simply MUST have their very own durable mp3 speaker. eKids is committed to the safe and responsible design of quality kids toys and electronics - and recognized as a leader in cutting edge kids technology, and electronic merchandise. MAKE YOUR OWN PLAYLIST: Connect your mp3 so you can play and sing your own music. The handy storage compartment keeps your device safe while you're in full party mode. REAL MIC, PLUS FLASHING LIGHTS Your boombox lights up and flashes along to music. And if you have an announcement to make, use the mic to enhance your voice without music! WHERE FUN MEETS PERFORMANCE: eKids is committed to the safe and responsible design of quality kids toys and electronics - and recognized as a leader in cutting edge kids technology, and electronic merchandise.